CustomFieldsFeedServlet was available without authentication and it allowed for users to pass a file path that would be deserialized via readObject(). In order to exploit this, the attacker needs to be able to make their payload accessible to the Applications Manager instance. On platforms other than Windows, the attacker can drop their payload to disk via one of the many SQL injection vulnerabilities in Applications Manager. It is easier to exploit this vulnerability on Windows as the class used to open the passed file path will resolve and read data from UNC paths, which allows for exploitation without chaining vulnerabilities. The payload used in this exploit is generated using ysoserial. 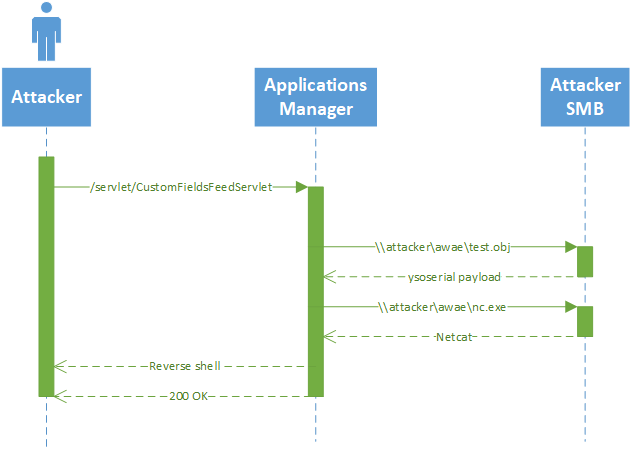 This payload is served from a public SMB share on the attacker’s machine created with the Impacket SMB server example. Several things went wrong to cause this vulnerability. First, the lack of authorization on a security sensitive endpoint was addressed previously in CVE-2018-11808. Second, developers need to take extra caution when dealing with the file system, especially when paths are user controlled input. It is very important to know how the classes you are using to interact with the file system will interact with “interesting edge cases” like symbolic links, hard links, and UNC paths. Finally, unsafe deserialization should be avoided even in cases where input can be trusted because having it in a codebase increases the likelihood that unsafe deserialization will be possible in the future either through copy/pasting or unforeseen requirements changes. While this vulnerability was remediated in Applications Manager 13740, I recommend discontinuing use of this software and rebuilding systems where ManageEngine/Zoho products are installed or systems where a ManageEngine/Zoho product had privileged access to.